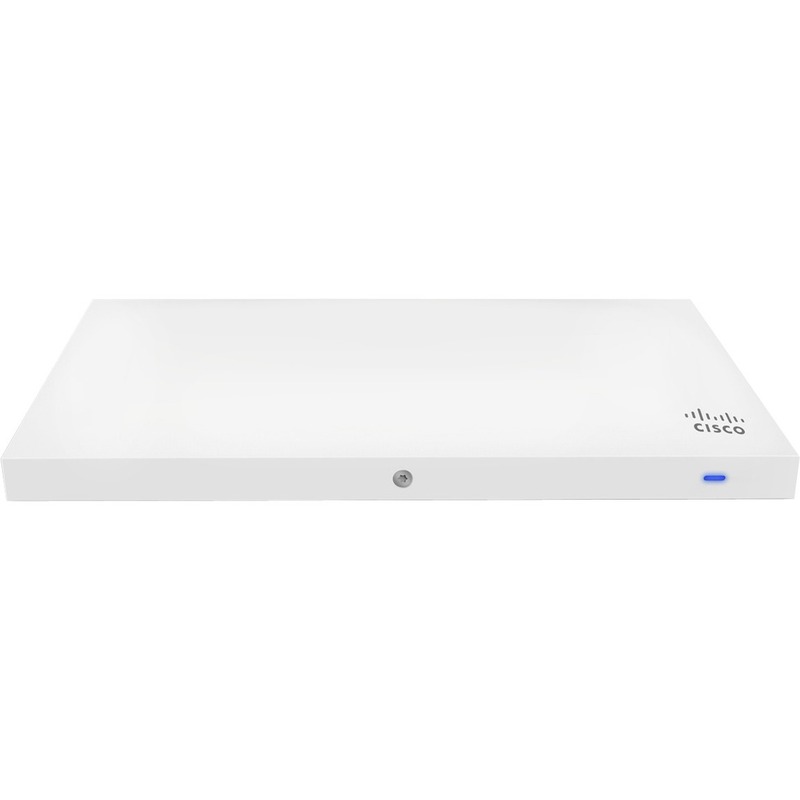 Dual-band, 802.11ac Wave 2 2x2:2 MU-MIMO Access Point with dedicated security and RF management radio as well as integrated Bluetooth Low Energy beacon and scanning radio Entry-level cloud-managed 802.11ac wireless The Cisco Meraki MR33 is a quad-radio, cloud-managed 2x2:2 802.11ac Wave 2 access point with MU-MIMO support. Designed for next-generation deployments in offices, schools, hospitals, shops, and hotels, the MR33 provides performance, enterprise-grade security, and simple management. The MR33 provides a maximum 1.3 Gbps aggregate frame rate with concurrent 2.4 GHz and 5 GHz radios. A dedicated third radio provides real-time WIDS/WIPS with automated RF optimization. An integrated Bluetooth Low Energy (BLE) radio delivers beacon and scanning capabilities. The combination of cloud management, 802.11ac Wave 2, full-time RF environment scanning, and integrated Bluetooth technology delivers the throughput, reliability, and flexibility required by demanding business applications like voice and high-definition streaming video, today and tomorrow. MR33 and Meraki Cloud Management: A Powerful Combination The MR33 is managed through the Meraki cloud, with an intuitive browser-based interface that enables rapid deployment without training or certifications. Since the MR33 is self-configuring and managed over the web, it can even be deployed at a remote location without on-site IT staff. The MR33 is monitored 24x7 via the Meraki cloud, which delivers real-time alerts if the network encounters problems. Remote diagnostics tools enable real-time troubleshooting over the web, meaning multi-site, distributed networks can be managed remotely. The MR33''s firmware is always kept up to date from the cloud. New features, bug fixes, and enhancements are delivered seamlessly over the web, meaning no manual software updates to download or missing security patches to worry about. Aggregate data rate of up to 1.3 Gbps A 5 GHz 2x2:2 radio supporting 80 MHz channel widths and a 2.4 GHz 2x2:2 radio supporting 40 MHz channel widths offer a combined dual-radio aggregate frame rate of 1.3 Gbps, with up to 866 Mbps in the 5 GHz band thanks to 802.11ac Wave 2 and 400 Mbps in the 2.4 GHz band. Multi User Multiple Input Multiple Output (MU-MIMO) With support for the 802.11ac Wave 2 standard, the MR33 offers MU-MIMO for more efficient transmission to multiple clients. Especially suited for enviroments with numerous mobile devices, MU-MIMO enables multiple clients to receive data simultanously. This increases the total network perfomance and the improves the end user experience. Dedicated third radio delivers 24x7 wireless security and RF analytics The MR33''s sophisticated, dedicated dual-band third radio scans the environment continuously, characterizing RF interference and containing wireless threats like rogue access points. No more need to choose between wireless security, advanced RF analysis, and serving client data: a dedicated third radio means that all three occur in real-time, without any impact to client traffic or AP throughput. Bluetooth low energy Beacon and scanning An integrated Bluetooth low energy radio provides seamless deployment of BLE Beacon functionality and effortless visibility of BLE devices within range of the AP. The MR33 enables the next generation of location-aware applications and engagement right out of the box. The Cisco Meraki MR33 is a quad-radio, cloud-managed 2x2:2 802.11ac Wave 2 access point with MU-MIMO support. Designed for next-generation deployments in offices, schools, hospitals, shops, and hotels, the MR33 provides performance, enterprise-grade security, and simple management. The MR33 provides a maximum 1.3 Gbps aggregate frame rate with concurrent 2.4 GHz and 5 GHz radios. A dedicated third radio provides real-time WIDS/WIPS with automated RF optimization. An integrated Bluetooth Low Energy (BLE) radio delivers beacon and scanning capabilities. The combination of cloud management, 802.11ac Wave 2, full-time RF environment scanning, and integrated Bluetooth technology delivers the throughput, reliability, and flexibility required by demanding business applications like voice and high-definition streaming video, today and tomorrow. The MR33 is managed through the Meraki cloud, with an intuitive browser-based interface that enables rapid deployment without training or certifications. Since the MR33 is self-configuring and managed over the web, it can even be deployed at a remote location without on-site IT staff. The MR33 is monitored 24x7 via the Meraki cloud, which delivers real-time alerts if the network encounters problems. Remote diagnostics tools enable real-time troubleshooting over the web, meaning multi-site, distributed networks can be managed remotely. The MR33's firmware is always kept up to date from the cloud. New features, bug fixes, and enhancements are delivered seamlessly over the web, meaning no manual software updates to download or missing security patches to worry about. A 5 GHz 2x2:2 radio supporting 80 MHz channel widths and a 2.4 GHz 2x2:2 radio supporting 40 MHz channel widths offer a combined dual-radio aggregate frame rate of 1.3 Gbps, with up to 866 Mbps in the 5 GHz band thanks to 802.11ac Wave 2 and 400 Mbps in the 2.4 GHz band. With support for the 802.11ac Wave 2 standard, the MR33 offers MU-MIMO for more efficient transmission to multiple clients. Especially suited for enviroments with numerous mobile devices, MU-MIMO enables multiple clients to receive data simultanously. This increases the total network perfomance and the improves the end user experience. The MR33's sophisticated, dedicated dual-band third radio scans the environment continuously, characterizing RF interference and containing wireless threats like rogue access points. No more need to choose between wireless security, advanced RF analysis, and serving client data: a dedicated third radio means that all three occur in real-time, without any impact to client traffic or AP throughput. An integrated Bluetooth low energy radio provides seamless deployment of BLE Beacon functionality and effortless visibility of BLE devices within range of the AP. The MR33 enables the next generation of location-aware applications and engagement right out of the box. In Stock*: Product availability status as of the previous business day and is subject to change. Search results and their descriptions can vary as they are provided by a third-party.